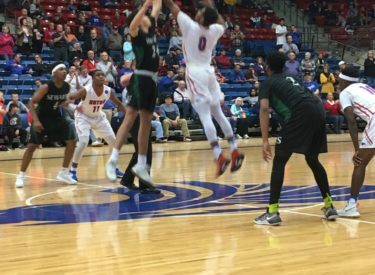 Playing without the KJCCC’s leading scorer Kevin Sims, Seward ran out of steam in an 88-65 loss to second ranked Hutchinson in the Hutchinson Sports Arena Wednesday night. Sims was injured in the Garden City game Saturday. Micah Littlejohn also injured his knee in the loss. The Saints led early by six at the 16:23 mark. But the Blue Dragons led 50-34 at the half. The Dragons out rebounded the Saints 53-40. Malik Brown scored 15 while Tre Kidd had 14. The Dragons are 18-0 and 14-0 in the Jayhawk while Seward is 6-12 and 3-11. Seward hosts Butler Saturday at 8 on 107.5 and kscbnews.net. Billy’s is the buyout sponsor.